Well, I DID meet Jamie Durie from HGTV’s The Outdoor Room and PBS’s The Victory Garden at the Grand Opening of Summer Winds Nursery on Saturday. I didn’t really look at his book, The Outdoor Room though. I confess to buying it just so I could stand there and look at him up close while he signed it. That alone was worth the price. But then, I opened it when I got home and…IT’S GORGEOUS! Beautiful photography combined with detailed site plans, zonal plant lists and helpful eco-tips inspire you to design something…anything! But it does it in a very approachable way, starting with the basics of landscape design and adding practical, hands-on information to help you get there. Even cooler? He’s from Australia (yes, he has a giggle-worthy accent!) which has some of the same arid desert conditions that make gardening a challenge here in Phoenix. So check out Jamie Durie’s excellent xeriscape ideas and plants that can help you dramatically re-shape your landscape. I haven’t been to Summer Winds Nursery, but they’re opening a new one down the street from us at 16th Street & Bethany Home Road. Of course, I’ll check it out and report back! 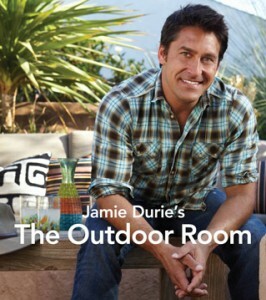 In addition to Grand Opening specials, Jamie Durie from HGTV will be there promoting (and signing) his book, The Outdoor Room . (I think he’s also doing some sort of talk, too.) He’s from Australia and many native Australian plants do really well here in Phoenix. So he gets the whole xeriscape thing and the challenges we face with gardening in the desert. The Summer Winds Grand Opening is Saturday, October 1 so check them out! I remember my grandma saving kitchen scraps for her garden. That was a long time ago, when it wasn’t trendy to recycle kitchen scraps. It was just what farm families did back then. Today, we call it compost and anyone growing so much as a carrot in their “urban farm” is using it to amend our tough Phoenix soil. But it’s not so simple as throwing everything into a bin and getting good dirt. But it’s not terribly hard either. Here’s how to start getting a hot pile…you can get more fancy later! 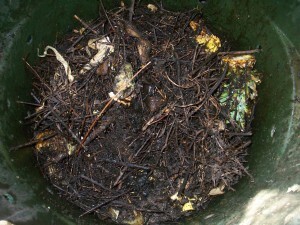 Add equal layers, a couple inches thick, of browns (dead leaves) and greens (kitchen scraps) to your bin. Add enough water to dampen. Turn pile every 3-7 days, making sure to add enough water to dampen. I’ll get into more details later, but this is a good starting point. If you want to read more, check out Composting For Dummies . It’ll answer all your composting questions…and more!